Mozart’s glorious motet Exsultate, jubilate is sung here by Dame Kiri Te Kanawa. If we were to witness this today — a mountain covered with cloud, with bright flashes of lightning showing through at the top, and an ear-splitting noise like a trumpet, and then a loud voice speaking to us — we would look around for the person responsible, David Copperfield perhaps, the "man behind the curtain". But the Hebrews could not explain it by technology. It did not exist. They knew for certain that it was God they were seeing and . . . they did not like the experience. They had seen the actions of this Being, done for their benefit, to deliver them from Egypt, and those were terrifying enough: a great body of water opening to let them pass and then collapsing on the Egyptians; a silent angel who came in the night and killed every firstborn. How terrified would we be, if one night the eldest child of every woman and female beast were to die, for no discernible cause. The fact is, seeing and hearing the overwhelming sensory experience of Mount Sinai, and knowing what a fearful Being God actually is, they realize that they cannot experience Him without dying. For, like us, they are full of sin. God, in the presence of sinfulness, becomes an angry God to be feared to the utmost. A human being cannot face Him and survive. God appears to the Hebrews to give them the Ten Commandments directly; and here, we see a second purpose. He intends to save the Hebrews (and, eventually, all those who will follow His Son). But the beginning of salvation, like the beginning of wisdom, is fear of the Lord. If we do not fear God, we will die. For we and the world we live in are His creation and like any creator, He will edit His work. The parts that are true to His vision will live on for eternity, for God is not bound by time; but the parts that offend Him, He will remove. So this is the second purpose of God's appearance to the Hebrews. No longer will any of them desire to see God. Rather, they will take instruction from His prophet, so that they might become worthy to appear before Him some day. 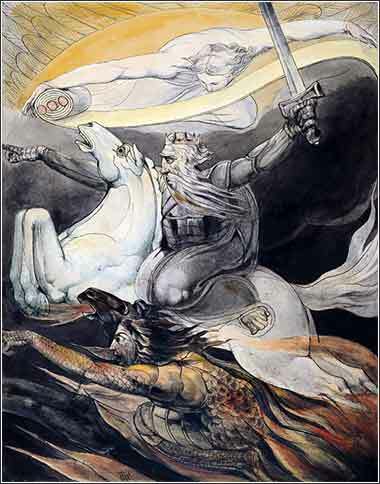 Death on a Pale Horse, another fearful depiction of the Divinity, this one a scene from Revelation by William Blake, ca. 1800.